Wild and Wonderful – the state of West Virginia has some of the most beautiful destinations in the entire world. Right in our own backyards are incredible landmarks, state parks, and breathtaking scenic views. For a summer packed full of adventure, take the ultimate road trip through the windy roads of this magnificent, mountainous state. By heading north on Route 20, roughly 30 minutes away, will land you in Hinton, West Virginia. In this small town, you have access to Bluestone State Park. While visiting you can camp out or rent a cabin for your stay. The park has some of the best spots to have a picnic while enjoying the surrounding wildlife. Nearby, is the Bluestone Lake which can satisfy your inner water bug needs. During the summer, many fishermen or kayakers find their home on the lake. The town of Hinton, while very small, is quaint and has many interesting finds. In the heart of the town are local shops, including Grandma’s House. This is an antique shop filled with a wide selection of signs, trinkets, and displays from the early 1900’s. A couple store fronts down is The Market on Courthouse Square. This locally owned restaurant caters to a variety of taste buds. Their menu features brick oven pizza, to specialty sandwiches and burgers. By travelling north on Interstate – 64, you’ll find yourself in the 2011 “Coolest Small Town in America,” known as Lewisburg. Downtown, there are shops galore, such as Bella The Corner Gourmet and The Wild Bean restaurant. This urban style restaurant features vegan and vegetarian options. Throughout the summer, Lewisburg holds several festivals you won’t want to miss! The Lewisburg Literary Festival celebrates literature with authors, writing workshops, entertainment and more. Also held in August, The West Virginia State Fair has something for the entire family from fair foods such as the classic corn dog to huge mouthwatering cinnamon rolls. During the fair there’s a carnival for the ride enthusiasts, livestock shows, for the animal lovers, and grandstand shows featuring the biggest artists of today. Next stop: Cass, West Virginia. 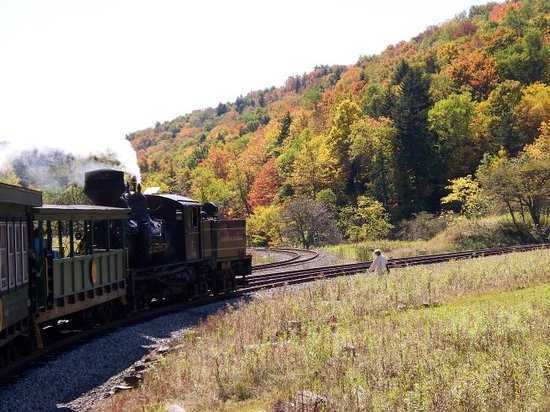 The historic town includes Cass Scenic Railroad and State Park. The site offers rides along an 11-mile long railroad taking you through the alluring Blue Ridge Mountains. The steam locomotive takes you to an overlook at Bald Knob, which is the third highest point in the state. The three-hour trip to the top of the mountain is well worth it for the breathtaking views and an experience you won’t ever forget. In a neighboring town, Greenbank, West Virginia gives the experience of a lifetime. Tucked away in the mountains of Pocahontas County, is the Green Bank Telescope. The telescope is the world’s largest fully steerable radio telescope, still in operation today. You can take a trip to view the telescope up close or view from afar, as it can be seen for miles. While visiting, experience the observatory, which has fun activities for both young and old. Learn about astronomy, cosmology and black holes with world class workshops and programs. 90 miles north-west, the Trans-Allegheny Lunatic Asylum in Weston offers both historic and paranormal tours for those brave enough to enter. This European-style building served as a psychiatric hospital until the mid-90’s. Today this tourist destination is the perfect stop for thrill seekers and history lovers alike. During the tour, take a step back into time and learn about the patients’ experiences in the hospital. Find out for yourself if it’s haunted or if the stories are only a myth. The State Capitol itself is one of the most mesmerizing buildings in the entire state. Made of 23-karat gold and intricate architecture makes the landmark unlike any other. Right down the street is the Capitol Market, which is full of fresh produce, chocolates, cheeses and a variety of other specialty items. Back through town, First Watch: The Daytime Café, is a delicious offering for breakfast and brunch options. Stop by Fayetteville for an incredible journey. This small town is packed with activities the entire family will love. The New River Gorge Bridge, one of the most photographed sights in the state, is one you need to see with your own eyes. Other activities in the area include biking or hiking peaceful trails with spectacular views, taking a rafting trip on the river, or taking your own personal Bridge Walk, which takes you right under the structure. Pies & Pints is the perfect ending to the day. In historic, downtown Fayetteville the pizzeria has an outstanding atmosphere and even better grub. Another local favorite is the Secret Sandwich Society restaurant that has delicious sandwich combinations plus soups, salads, and live music. Whichever you pick, you won’t go home disappointed or hungry. The greatest aspect of living in West Virginia is the incredible landmarks and exhilarating nature experiences that can’t be found anywhere else. This summer, take a trip around our state and find out the reasons why we are Wild and Wonderful. Will Removing the Math Education Program Impact Public Schools?